A bank-owned house is offered for sale in Pasadena, Calif. The government finally seems to be making progress in its efforts to stem the foreclosure crisis. Housing and Urban Development (HUD) officials say lenders extended loan-modification offers to 40,000 borrowers who were struggling to pay their mortgage in the second week of June. That is nearly triple the weekly average of about 15,000 workouts that loan servicers had extended in the prior 10 weeks since the government's latest foreclosure-prevention plan was announced. 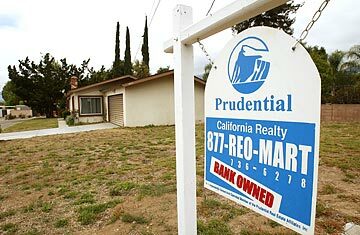 "Foreclosures were becoming a self-reinforcing problem for the housing market," said HUD head Shawn Donovan, speaking to journalists last week at the National Association of Real Estate Editors' annual conference. "Already we are seeing signs that the housing market is better off than when President Obama took office." Of all the problems related to the financial crisis, the rising number of home foreclosures has been one of the most persistent and toughest to solve. One plan, Hope for Homeowners, which was launched by the government with much fanfare last fall, has helped just 51 borrowers get lower-cost loans. Another program, the Hope Now Alliance, which is a voluntary effort put forth by lenders, has reached more than 4 million borrowers. But it is estimated that less than a quarter of those borrowers assisted in the lenders' program ended up with more affordable loans. In fact, many of the borrowers "helped" by the Hope Now Alliance have actually seen their monthly fees go up, as lenders spread unpaid balances over future months, rather than forgiving part of what was owed. In March, the government launched the Making Home Affordable program. The plan's biggest difference is that the government agrees to pay servicers a few thousand dollars per loan they modify, depending on when they make the offer and how successful it is. The longer the homeowner stays current on the loans, the more a loan servicer would receive. The government also pledged $10 billion to offset the losses that banks and mortgage investors might suffer because of the modifications. At first the plan, like the ones before it, seemed to get off to a slow start. But in the past few weeks, the government's efforts seem to be attracting more and more lenders who are willing to lower monthly payments and make other modifications that will help troubled borrowers keep their houses. Still, some consumer advocates say the government's latest effort does not go far enough. Even if the 40,000 modifications-a-week pace is sustainable, that means the government's plan will reach just over 2 million troubled borrowers in the next year. That's far fewer than the estimated 6 million American homeowners who are at risk of facing foreclosure in the next year or so. And those estimates of likely foreclosures have been rising recently. "It's too early to tell how many people the program will help," says Ken Wade, head of NeighborWorks, a national foreclosure-mitigation counseling service. "Servicers are still not responding to troubled borrowers as fast as they should."